In the emergency medicine residency program at SUNY Upstate, residents cut open live pigs and inserted tubes, needles, and catheters into their abdominal cavities and bones. Residents also spread open the animal’s ribs to access the heart. Following these invasive procedures, the animals were killed. Today, I was going to write to ask for your help in ending the use of animals in emergency medicine training at SUNY Upstate Medical University in Syracuse, N.Y. Instead I am able to share with you a great success. It turns out that SUNY Upstate has agreed with our position and has stopped using animals. 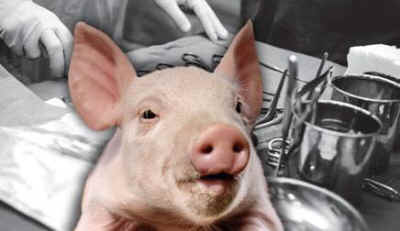 Here is the short version: In the emergency medicine residency program at SUNY Upstate, residents cut open live pigs and inserted tubes, needles, and catheters into their abdominal cavities and bones. Residents also spread open the animal’s ribs to access the heart. Following these invasive procedures, the animals were killed. Earlier this month, the Physicians Committee filed a complaint with the United States Department of Agriculture, explaining that SUNY Upstate was violating the federal Animal Welfare Act. After filing our complaint with the USDA, SUNY Upstate announced that it had decided to replace the use of animals with "more valuable teaching methods." The school joins the ranks of the 86 percent of surveyed emergency medicine residency programs in the United States that believe using human-based methods are a better way to train doctors than needlessly killing animals. Unfortunately, there is still work to be done elsewhere. In particular, animals are still used in similar courses at the University of Texas Medical Branch at Galveston (UTMB). And this is where I could use your help. Please help us continue the pattern of humanizing medical procedural training by contacting the UTMB and asking school leaders to end the use of animals in trauma training - Ask University of Texas Medical Branch at Galveston to End the Use of Goats in its ATLS Courses.